News just in from Julian Calder at Fraser Yachts of a $500,000 price cut on the 24.68m sailing yacht Aiyana, a joint listing with his colleague James Munn. She’s the first in a series built by Alia Yachts in 2010 to a design by Warwick Yacht Design with composite engineering by High Modulus. Aiyana features generous accommodation for six guests in three staterooms and a fourth convertible cabin provides room for two additional guests or crew. 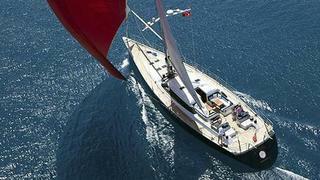 Other features of Aiyana include a large pilothouse saloon, an exquisite mahogany interior and a hydraulic lifting keel. The new asking price is $5.45 million.